Summerfest: Jonas Brothers Summerfest Stop in 2008! Jonas Brothers Summerfest Stop in 2008! Call them the Jonas Brothers. Call them Jo-Bro. However you call it, these guys are the biggest thing since sliced bread. 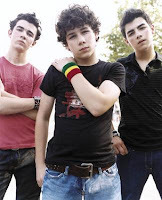 I am WAY too old to understand the sensation, but after selling out countless venues, Summerfest has announced that the Jonas Brothers will play the 23,000 seat Marcus Amphitheater on July 6, 2008. Can these guys sell that place out? I understand The Rave, but 23,000 screaming 15 year old girls! OMG! The Jonas Brothers have released two albums. The most recent is self-titled with singles like, "Hold On", "Kids of the Future" and "Year 3000". It's like Hanson all over again. The brunette version, if you will. Summerfest and Ticketmaster have announced that Jonas Brothers tickets will go on sale Saturday, March 15th at 11a and Jo Bro tickets will be $30, $45 and $55 before additional service fees. There will be an opening act, though it hasn't been announced yet.